Would your colleagues love the chance to test their team working skills in the great outdoors while doing their bit to support wildlife? Book a Team Building Day at Carymoor! We can plan a full or half day packed with challenges and conservation activities for your team. 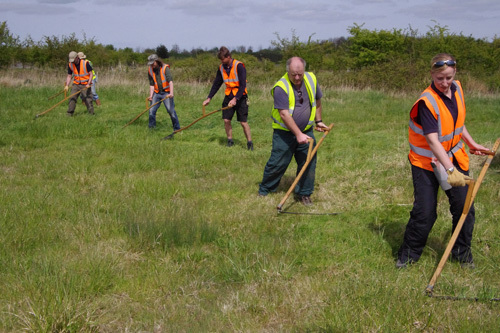 Depending on the season your colleagues could be hay raking in our meadows, coppicing trees, laying hedges, planting wildflowers, scything, or working on construction projects using traditional techniques. This is a chance for your team to work together in the fresh air, which is great for health and wellbeing. Plus you'll be helping to protect the vital habitats for wildlife on our nature reserve. Step 2: We will get in touch to arrange your Team Building Day. Thank you!